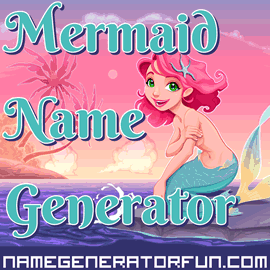 The Original Mermaid Name Generator - Adorable Family Fun! The Original Mermaid Name Generator - for Magical Fun! Do you feel the call of the waves? Does living under the sea sound like a great idea? Then don your seashell-heavy clothing and embrace the underwater life with The Original Mermaid Name Generator! Are you the kind of girl who likes to hang around on rocks brushing her hair all day? Do you have a particularly good singing voice? Do you spend too long in the bath? Do you hate wearing clothes? Are you rather fond of good-looking sailors? Perhaps you have a secret identity and you've come from the world under the ocean! You can use our generator to create names for mermaids and mermen of all ages, and it gives you the choice of making either a random name, or a distinct aquatic alter ego that's based on your own name. Alongside your new name, you'll also get a Latin name for the species of your merfolk, as well as description of your mermaid's appearance, where they live, and their personality. It's ideal for creating a distinct character for a fantasy roleplaying game, for inspiring writers, or just for the sheer underwater fun of it all! The Original Mermaid Generator has been online since Emma wrote it in 2010. It's a particularly quirky generator and was designed to sound like a natural history encyclopedia. It was the first generator to create names for mermaids and mermen – and while a number of websites have since mimicked this generator, it's still the only one that also include details like your mermaid's species and personality. We hope you enjoy using the generator and creating strange and distinctive merfolk! If you liked this generator, you might also like our pirate names, fairy names, or our elf names. Image Credit: Mermaid designed by Ddraw. Licensed under CC BY 3.0.